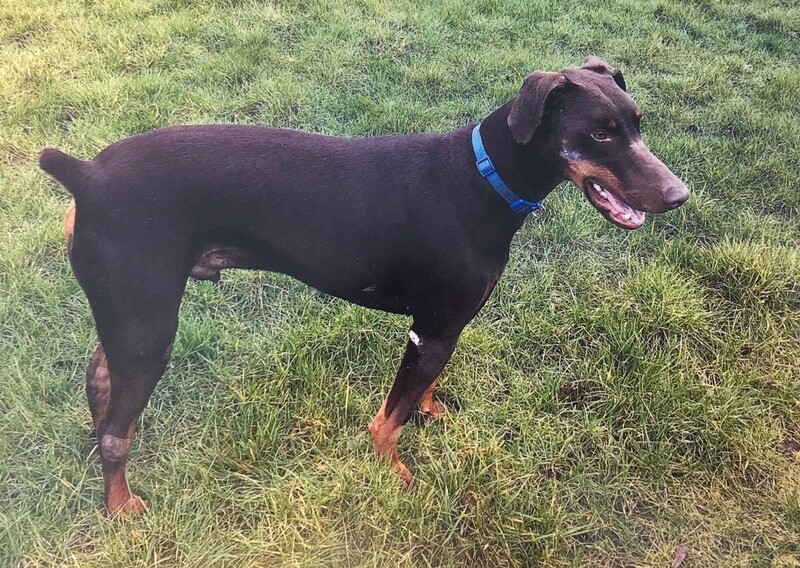 This month’s star patient is a handsome, 3-year-old Doberman called ‘Chico’! Chico was rescued from Spain two and a half years ago. Despite being a rescue dog, he appeared fit & healthy, coming into the vets for only routine vaccinations and castration and for treatment for cracked, sore skin on his elbows. Recently, Chico’s owners brought him in for a consultation with Vet Helen. Chico had become stiff on his back legs and was lame. Vet Helen noticed that Chico’s hock joints were very swollen with fluid (joint effusion) and were warm to the touch. On further examination she could feel crepitus (a grating sensation felt between bone and cartilage) in his stifles and his hips were reluctant to extend. Chico was given pain relief and booked in for an anaesthetic to take radiographs (x-rays) and for a joint tap procedure. This is when fluid is taken from the swollen joint and examined under the microscope. He also had some blood taken to test for a condition called Leishmaniasis. Leishmaniasis is a disease that is present in much of Europe and warmer areas of the world. It is an infection that is caused by a protozoal (single celled) organism which lives in host bodies and is spread by female sand-flies. Although it is not seen in the UK dog population, dogs that have either been imported or travel abroad on holiday to affected areas are at risk of contracting the disease. Chico was experiencing some of the many clinical signs that can be associated with Leishmaniasis, including the joint swelling, lameness and slow to heal wounds on his elbows. He was originally from Spain which is a country where this infection is common. Chico’s blood test showed a high result confirming a diagnosis of Leishmaniasis. The x-rays also revealed mild Hip Dysplasia and the early onset of Osteoarthritis in his stifle joints. Chico’s Leishmaniasis had been subclinical, meaning the infection was dormant and not showing any signs or symptoms for many years. He contracted the infection whilst still in Spain. Chico started treatment to control the Leishmaniasis immediately. Once a dog has been diagnosed with a leishmaniasis active infection it is not possible to cure the infection and long-term medication and monitoring is usually required to control the clinical signs and maintain good quality of life. Active infections if left untreated can be fatal. Unfortunately, the medicine required can also have unpleasant side-effects, so Chico’s owners have been monitoring him carefully. Luckily, he is coping well with the medication so far. Chico will also continue with long-term pain relief medication to keep his hips and stifles comfortable. Throughout all the difficulties Chico has encountered in his short life, he has remained a friendly, loveable chap. All the staff enjoy his visits and we hope he continues to have a good quality of life for as long as possible. This star award is completely deserved, Chico, you are a star!